Sweet child, all of this is true. There is so much beauty in the world. There are the instagrammable moments of beauty, like sunsets and spiderwebs catching morning dew and huge puffy clouds that look like your favorite stuffed animal. There are green hillsides that prepare for their winter slumber by donning the most spectacular bedclothes of yellow and orange and red. There is the smell of freshly cut grass and sassafras trees and your favorite meal cooking on the stove. There are miles of highway stretched out in front of you, taking you to friends and family you haven’t embraced in far too long. Some beauty is harder to capture on an iPhone. That’s because it’s often the kind of beauty that can only be experienced when the terrible things happen. It’s the beauty of humanity. Don’t get me wrong, dear boy. Humanity can be ugly. We war against one another – sometimes with guns, sometimes with words, and sometimes simply by turning our backs. We allow our differences to fuel violence. We embrace ignorance rather than understanding. But those terrible moments often allow us to see the goodness of humanity. When one chooses to be a villain, others will choose to be heroes. When some choose to wound, others will choose to heal. When some choose hatred and violence, others will choose love and peace. Sometimes we don’t know the role that we will play. I think this is where fear plays in. What if I make this choice and it’s the wrong one? 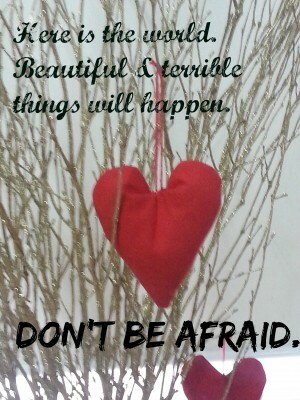 What if I cause the terrible rather than the beautiful? Child, sometimes you will make that wrong choice. You will be the instrument of pain, or your choice, even if it is good in itself, can lead to pain. We cannot escape it, so don’t try. Because when you choose to live a risky life, you will see more. More of the terrible, yes, but so much more of the beautiful. You will have the opportunity to experience generosity, and kindness, and laughter. You will see that light shines in the darkness and the darkness cannot overcome it. Welcome, welcome, welcome, Leo. Make the world beautiful. This entry was posted in Writing and tagged birth, Frederick Buechner. Bookmark the permalink. Thank you, thank you, thank you, Alise. For this welcome. For your strength. And for your friendship. Thank you, in the midst of your joy, for taking a moment to grieve with us. I can’t tell you what that meant last night. What a gift, Alise. Thanks for this loveliness. WOW. I do not know you, but I have known Maile since I was 2 1/2… and because of her, I have been blessed to know Shawn, and their family. Thank you for posting this. I was in tears reading the words Shawn wrote, and what you wrote. Thank you for the incredible reminder of how precious and amazing and touching and incredible this life is…. we never know what the Lord has for us… and Thanks be to God for all that He gives and blesses us with. Thank you so much for the grace you have given here. You will be in my prayers.